Entertaining? 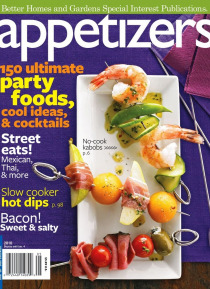 Find exactly what you need in this magazine packed with party recipes, ideas, and tips. Appetizers include finger-licking-good meat tidbits, foods from street vendors the world over, and 100-calorie appetizers for diet-conscious guests. Recipes for various cocktails complement the small-plate options.